Being a completist is weird. Buying things you don't actually want just because they exist? That sounds like a mental defect, not a life goal. But still, you have to pity anyone who wants to be a completist with Funko POP! Vinyls. There are scores of various exclusives, all of which have an official release number and place in the line. And they're not only available in stores and at conventions, sometimes the only way to get them is in the various subscription boxes Funko offers. 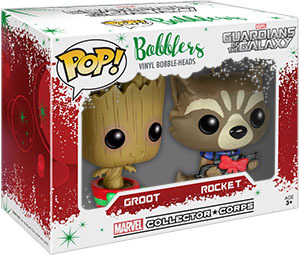 For instance, the December 2015 "Marvel Collector Corps" box was Guardians of the Galaxy-themed, and included a set of holiday POP! Bobblers - Rocket Raccoon and Groot. The box itself is festive, with snowy white edges and a red background with green stars. And luckily, you don't have to destroy it to get at the toys inside, because it's not sealed, and the figures are just held in place by folded-over plastic. Easy to get at, easy to store away! 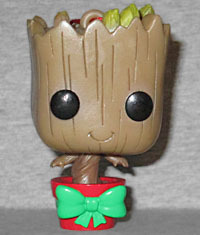 Groot is a third-generation design. We began with Dancing Groot, a POP! based on the tiny, potted sapling seen at the end of the film; that was redecoed as Holiday Dancing Groot (as well as a Hot Topic exclusive that added some light snow to the design); now the basic design has been shrunk down to 3⅛". Following the POP! aesthetic, Groot has a large head and a small body. He's got the large black eyes and a cute little smile. The top of his head is spiky, with a few green sprouts poking out the top (as well as a molded plastic loop, because these are ornaments, not only toys). His tiny, twisty body has two small arms, but then just disappears into the soil rather than having legs. This Groot doesn't get any snow, sadly, so the only thing "holiday" about this is that he's sitting in a red pot with a green bow. Rocket, on the other hand, is really getting into the spirit! He's just slightly taller than Groot is, thanks to his ears, but because of the furry tufts on his cheeks, his head is very much wider. The POP! style almost makes him look like he has three eyes, because the triangular nose his little bumped-out snout is the same solid black as his eyes. Groot had some sculpted wood grain, but only the broadest strokes of fur are present on Rocket. His fur is brown, with darker areas on his face and striped on his tail, plus a lighter color on his beak and forehead. So what makes him winter-ready? His clothes are brown and orange, just like usual, and he's got tiny little toes sculpted on his tiny little feet - so no Santa boots, either. His seasonal variation comes in the form of a blue scarf tied around his neck, and a big red bow tied on the gun he's holding. Festive and deadly - just like poinsettias! [No, poinsettias are fine, it's white mistletoe berries that are poisonous --ed.] He has a loop on top of his head, and a red string tied through it - though for both these figures, you'll have to provide your own ornament hooks if you want to hang them on a tree. 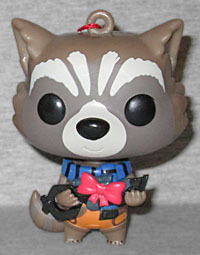 Because of the restrictions of toy licenses, all Funko's Marvel product - from Mystery Minis on up - has to be done as bobbleheads, not as plain figures. That means both of these figures have springs in their necks, rather than secure connections. It makes some sense when you're talking about normal toys, but for holiday ornaments it's not quite logical. But hey, such are the realities of toymaking. This pair was only available in a limited subscription box, so the only way to get it (other than subscribing before you knew it even existed) is on the secondary market. I lucked out, in that my local comicshop got the Guardians of the Galaxy Collector Corps box and parted out the contents, and so I got to add this cute little pair to my OAFEsmas tree.